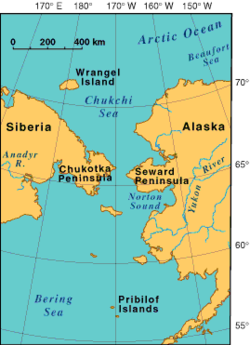 Location of the Chukchi Peninsula in Far East Siberia. The peninsula lies along the Northern Sea Route, or Northeast passage. It was said to be the location of the prison camp/lead mine where Cornelius Rost claimed to have been imprisoned, as described in the book "As Far as My Feet Will Carry Me," by Josef Martin Bauer. However, the existence of such a camp at that time has been refuted. Industries on the peninsula are mining (tin, lead, zinc, gold, and coal), hunting and trapping, reindeer raising, and fishing. 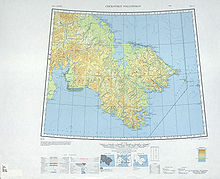 ^ "Chukchi Peninsula". Encyclopedia.com. Accessed September 2010. This Chukotka Autonomous Okrug location article is a stub. You can help Wikipedia by expanding it.